I have always got time for a meal at Urban Angel. It is a terrific cafe restaurant that goes out of its way to have good gluten free choices. On the corner of Hanover Street and Queen Street down some steep little stairs, it is in a busy. but light basement and is a good place for a catch-up over lunch or breakfast. 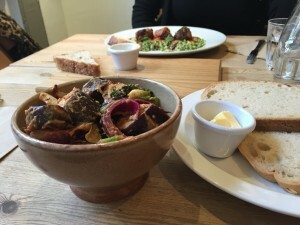 Service is friendly and there is clarity about what to order, with a choice of gluten free bread on the side. A blackboard of specials supplements the menu of largely salads, soups and veggie mixes. The food is always good quality and the staff are knowledgeable about what to choose. 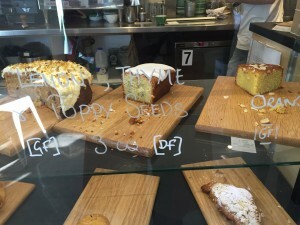 As with most places, it is a good idea to flag up your gluten free needs – and they will certainly cater for them. After a small accidental slice of gluten-filled bread appearing with my salad (which was quickly whisked away and given to my fellow diner, much to her delight) I enjoyed an aubergine, red onion and spinach salad. Two huge slices of gluten free bread then appeared – you will not go hungry here! The salad was tasty and filling too, as was the lamb koftas with broccoli rice ordered by my friend. Urban Angel does not disappoint on cakes. There were two gluten free cakes to choose from: orange and almond or lemon and poppy seed. Choosing the lemon, it was hugely moist and light, with zingy lemon icing – and went well with my tea. It was a lovely treat and I highly recommend the cakes here, whether you are after gluten free or not. Urban Angel can get really busy for breakfast and lunch and it’s always a good idea to book, if you can, though at weekends they do not take bookings. It is a great place for a cup of tea and a piece of cake, or for morning coffee. It has a nice vibe, the food is good quality and it is still one of my favourite places.